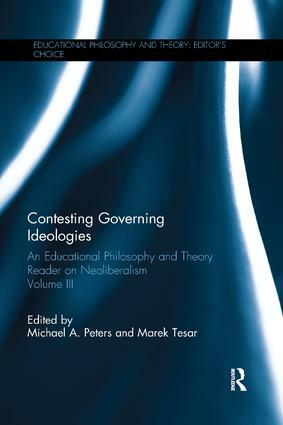 Contesting Governing Ideologies is the third volume in the Educational Philosophy and Theory: Editor’s Choice series and represents a collection of texts that provide a cutting-edge analysis of the philosophy and theory of performances of neoliberal ideology in education. In past decades, philosophy of education has provided a critical commentary on problematic areas of neoliberal ideology. As such, this collection argues, philosophy of education can be considered as an intellectual struggle that runs through the contemporary ideological landscape and has roots that go back to the Enlightenment in its traditions. This book covers multiple philosophical and educational theoretical perspectives of what we know about the ideology of neoliberalism, and many of its practices and projects. Neoliberalism is difficult to define, but what is certain is that it has significantly matured as a political doctrine and set of policy practices. This collection covers questions of ideology, politics, and policy in relation to the subject and the institution alike. The chapters in this book provide rich and diverse reading, allowing readers to rethink established discourses and contest ideologies, providing a thorough and careful philosophical and theoretical analysis of the story of neoliberalism over the past decades. Contesting Governing Ideologies will be key reading for academics, researchers and postgraduate students in the fields of philosophy of education, philosophy, education, educational theory, post-structural theory, the policy and politics of education, and the pedagogy of education. Michael A. Peters is Professor of Education at the University of Waikato, New Zealand, and Emeritus Professor in Educational Policy, Organization, and Leadership at the University of Illinois at Urbana–Champaign. He is the executive editor of the journal Educational Philosophy and Theory. Marek Tesar is a Senior Lecturer in Education at The University of Auckland, New Zealand, with a focus on philosophy of education and childhood studies. He is a member of the editorial board of Educational Philosophy and Theory.